I made this arrangement for a couple's wedding anniversary. Cream, plum, and green is one of my favorite palette choices. I painted the urn white using Farrow & Ball's 'Dimnity.' The branches of cherry blossoms framing the arrangement were rescued on my way home from the flower market. As I passed by a Mobile station I spotted these beauties fallen onto the cement next to a puddle of oil. They had been ripped from the tree the night before in a storm. I gave the attendant my best smile and was soon piling some huge branches into my car (which happens to be the most stellar yet unpractical car a florist and farmer could ever drive, but that's another story). Add to that the wild queen anne's lace, pensive clematis, sweet earthy hellebores and fragrant lilacs and dried lavender, and voila! The best part: white lilacs had been central to the couple's wedding decor. What a great coincidence. 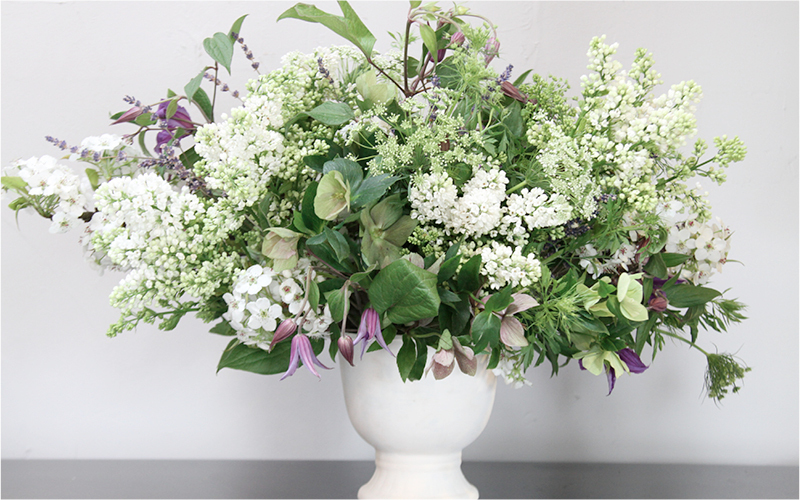 I delivered this arrangement all the way to Chappaqua but it was worth it to see the recipient's joy when she spotted those white lilacs. I love being able to make people so happy with flowers. Photography courtesy of John Videler.